Liz Fenton and Lisa Steinke are the authors of the new psychological suspense novel Girls' Night Out. Their other novels include The Good Widow and Your Perfect Life. 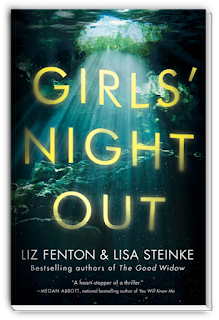 Q: You write in your acknowledgments, "Girls' Night Out broke us open, hard and wide, before putting us back together again." What impact did writing about friendship have on your own friendship? A: As we mentioned in the acknowledgments, we almost broke up over this book! Because of the multiple timelines and narratives, the editing was very difficult and we began to break down as a result—many buried issues snaking their way to the surface. But ultimately, we worked it out, and like to think we are stronger for it! Q: Why did you choose Tulum, Mexico, as the site of this new novel? A: Our agent had recently been there and suggested it might be a perfect location to set our next novel. So, of course we had to take a vacation there to research! It is truly a beautiful place—we highly recommend visiting! A: We did know how it would end, although we did change many small details in the editing process. Q: The novel jumps around in time, and is told from several characters' perspectives. Did you write the novel in the order in which it appears? A: No! And that was one of the things that made it challenging. We wrote each timeline and then put them together and because of that we had some problems with how each chapter connected in the first draft that we had to correct. A: We just finished a new novel that will hopefully be released next summer! We can’t say much about it yet, only that we love it, and hope you will too! A: Just that we are eternally grateful for every single person who reads our books and hangs out with us on social media. Thank you for your support! --Interview with Deborah Kalb. 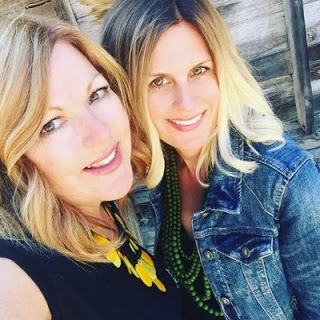 Here's a previous Q&A with Liz Fenton and Lisa Steinke.